32 m2 5 person cottages. 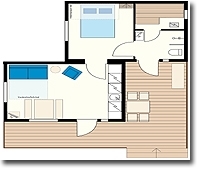 Hall, kitchen, bedroom, shower / wc, sauna, terrace. Equipment: Furniture for 5 persons, electric heating, water pipe at the kitchen, dishwasher, refrigerator, dishes, cooker/oven, coffee maker, microwave oven, cable tv, radio, free Wi-Fi, shower, wc, sauna, double bed + loft, bed/couch, blankets and pillows, table with benches, covered terrace. Linen and towels are included the price. There is 15 units of 32 m2 cottages at Santalahti.